As of 6 December 2018[update], PubMed has more than 29.1 million records going back to 1966, selectively to the year 1865, and very selectively to 1809; about 500,000 new records are added each year. As of the same date[update], 13.1 million of PubMed’s records are listed with their abstracts, and 14.2 million articles have links to full-text (of which 3.8 million articles are available, full-text for free for any user). Approximately 12% of the records in PubMed correspond to cancer-related entries, which have grown from 6% in the 1950s to 16% in 2016. Other significant proportion of records correspond to “chemistry” (8.69%), “therapy” (8.39%), and “infection” (5%). Simple searches on PubMed can be carried out by entering key aspects of a subject into PubMed’s search window. PubMed translates this initial search formulation and automatically adds field names, relevant MeSH (Medical Subject Headings) terms, synonyms, Boolean operators, and ‘nests’ the resulting terms appropriately, enhancing the search formulation significantly, in particular by routinely combining (using the OR operator) textwords and MeSH terms. A new PubMed interface was launched in October 2009 and encouraged the use of such quick, Google-like search formulations; they have also been described as ‘telegram’ searches. By default the results are sorted by Most Recent, but this can be changed to Best Match, Publication Date, First Author, Last Author, Journal, or Title. When a journal article is indexed, numerous article parameters are extracted and stored as structured information. Such parameters are: Article Type (MeSH terms, e.g., “Clinical Trial”), Secondary identifiers, (MeSH terms), Language, Country of the Journal or publication history (e-publication date, print journal publication date). A reference which is judged particularly relevant can be marked and “related articles” can be identified. If relevant, several studies can be selected and related articles to all of them can be generated (on PubMed or any of the other NCBI Entrez databases) using the ‘Find related data’ option. The related articles are then listed in order of “relatedness”. To create these lists of related articles, PubMed compares words from the title and abstract of each citation, as well as the MeSH headings assigned, using a powerful word-weighted algorithm. The ‘related articles’ function has been judged to be so precise that the authors of a paper suggested it can be used instead of a full search. PubMed automatically links to MeSH terms and subheadings. Examples would be: “bad breath” links to (and includes in the search) “halitosis”, “heart attack” to “myocardial infarction”, “breast cancer” to “breast neoplasms”. Where appropriate, these MeSH terms are automatically “expanded”, that is, include more specific terms. Terms like “nursing” are automatically linked to “Nursing [MeSH]” or “Nursing [Subheading]”. This feature is called Auto Term Mapping and is enacted, by default, in free text searching but not exact phrase searching (i.e. enclosing the search query with double quotes). This feature makes PubMed searches more sensitive and avoids false-negative (missed) hits by compensating for the diversity of medical terminology. and a wide range of other options. The “My NCBI” area can be accessed from any computer with web-access. An earlier version of “My NCBI” was called “PubMed Cubby”. In 2016, PubMed allows authors of articles to comment on articles indexed by PubMed. This feature was initially tested in a pilot mode (since 2013) and was made permanent in 2016. In February 2018, PubMed Commons was discontinued due to the fact that “usage has remained minimal”. PubMed/MEDLINE can be accessed via handheld devices, using for instance the “PICO” option (for focused clinical questions) created by the NLM. A “PubMed Mobile” option, providing access to a mobile friendly, simplified PubMed version, is also available. As most of these and other alternatives rely essentially on PubMed/MEDLINE data leased under license from the NLM/PubMed, the term “PubMed derivatives” has been suggested. Without the need to store about 90 GB of original PubMed Datasets, anybody can write PubMed applications using the eutils-application program interface as described in “The E-utilities In-Depth: Parameters, Syntax and More”, by Eric Sayers, PhD. Various citation format generators, taking PMID numbers as input, are examples of web applications making use of the eutils-application program interface. Sample web pages include Citation Generator – Mick Schroeder, Pubmed Citation Generator – Ultrasound of the Week, PMID2cite, and Cite this for me. ^ “PubMed Celebrates its 10th Anniversary”. Technical Bulletin. United States National Library of Medicine. 2006-10-05. Retrieved 2011-03-22. ^ Lindberg DA (2000). “Internet access to the National Library of Medicine” (PDF). Eff Clin Pract. 3 (5): 256–60. PMID 11185333. Archived from the original (PDF) on 2 November 2013. ^ “PubMed: MEDLINE Retrieval on the World Wide Web”. Fact Sheet. United States National Library of Medicine. 2002-06-07. Retrieved 2011-03-22. ^ Roberts RJ (2001). “PubMed Central: The GenBank of the published literature”. Proceedings of the National Academy of Sciences. 98 (2): 381–382. Bibcode:2001PNAS…98..381R. doi:10.1073/pnas.98.2.381. PMC 33354. PMID 11209037. ^ McEntyre JR; Ananiadou S; Andrews S; Black WJ; et al. (2010). “UKPMC: A full text article resource for the life sciences”. Nucleic Acids Research. 39 (Database issue): D58–D65. doi:10.1093/nar/gkq1063. PMC 3013671. PMID 21062818. ^ “NLM Catalogue: Journals referenced in the NCBI Databases”. NCBI. 2011. ^ Reyes-Aldasoro C (2017). “The proportion of cancer-related entries in PubMed has increased considerably; is cancer truly “The Emperor of All Maladies”?”. PLOS ONE. 12 (3): e0173671. Bibcode:2017PLoSO..1273671R. doi:10.1371/journal.pone.0173671. PMC 5345838. PMID 28282418. ^ “MEDLINE/PubMed Production Improvements Underway”. ^ “Simple Subject Search with Quiz”. NCBI. 2010. ^ Clarke J; Wentz R (September 2000). “Pragmatic approach is effective in evidence based health care”. BMJ. 321 (7260): 566–567. doi:10.1136/bmj.321.7260.566/a. PMC 1118450. PMID 10968827. ^ Fatehi, Farhad; Gray, Leonard C.; Wootton, Richard (January 2014). “How to improve your PubMed/MEDLINE searches: 2. display settings, complex search queries and topic searching”. Journal of Telemedicine and Telecare. 20 (1): 44–55. doi:10.1177/1357633X13517067. ISSN 1758-1109. PMID 24352897. ^ Jadad AR; McQuay HJ (July 1993). “Searching the literature. Be systematic in your searching”. BMJ. 307 (6895): 66. doi:10.1136/bmj.307.6895.66-a. PMC 1678459. PMID 8343701. ^ Allison JJ; Kiefe CI; Weissman NW; Carter J; et al. (Spring 1999). “The art and science of searching MEDLINE to answer clinical questions. Finding the right number of articles”. Int J Technol Assess Health Care. 15 (2): 281–296. PMID 10507188. ^ “Clinical Queries Filter Terms explained”. NCBI. 2010. ^ Huser V; Cimino JJ (2013). “Evaluating adherence to the International Committee of Medical Journal Editors’ policy of mandatory, timely clinical trial registration”. J Am Med Inform Assoc. 20 (e1): e169–74. doi:10.1136/amiajnl-2012-001501. PMC 3715364. PMID 23396544. ^ “Computation of Related Articles explained”. NCBI. ^ Chang AA; Heskett KM; Davidson TM (February 2006). “Searching the literature using medical subject headings versus text word with PubMed”. Laryngoscope. 116 (2): 336–340. doi:10.1097/01.mlg.0000195371.72887.a2. PMID 16467730. ^ a b Fatehi, Farhad; Gray, Leonard C.; Wootton, Richard (March 2014). “How to improve your PubMed/MEDLINE searches: 3. advanced searching, MeSH and My NCBI”. Journal of Telemedicine and Telecare. 20 (2): 102–112. doi:10.1177/1357633X13519036. ISSN 1758-1109. PMID 24614997. ^ “My NCBI explained”. NCBI. 13 December 2010. ^ “PubMed Cubby”. Technical Bulletin. United States National Library of Medicine. 2000. ^ “LinkOut Overview”. NCBI. 2010. ^ “LinkOut Participants 2011”. NCBI. 2011. ^ Team, PubMed Commons (17 December 2015). “Commenting on PubMed: A Successful Pilot”. ^ “PubMed Commons to be Discontinued”. NCBI Insights. 2018-02-01. Retrieved 2018-02-02. ^ “PubMed shuts down its comments feature, PubMed Commons”. Retraction Watch. 2018-02-02. Retrieved 2018-02-02. ^ “PubMed via handhelds (PICO)”. Technical Bulletin. United States National Library of Medicine. 2004. ^ “PubMed Mobile Beta”. Technical Bulletin. United States National Library of Medicine. 2011. ^ “Search Field Descriptions and Tags”. National Center for Biotechnology Information. Retrieved 15 July 2013. ^ Keener, Molly (19 May 2008). “PMID vs. PMCID: What’s the difference?” (PDF). University of Chicago. Retrieved 19 January 2014. ^ “Leasing journal citations from PubMed/Medline”. NLM. 2011. ^ a b c Lu Z (2011). 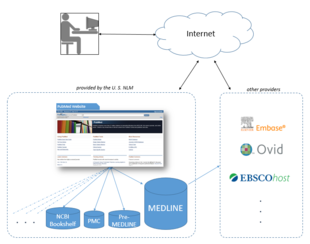 “PubMed and beyond: A survey of web tools for searching biomedical literature”. Database. 2011: baq036. doi:10.1093/database/baq036. PMC 3025693. PMID 21245076. ^ Fontaine JF; Barbosa-Silva A; Schaefer M; Huska MR; et al. (2009). “MedlineRanker: Flexible ranking of biomedical literature”. Nucleic Acids Research. 37 (Web Server issue): W141–W146. doi:10.1093/nar/gkp353. PMC 2703945. PMID 19429696. ^ States DJ; Ade AS; Wright ZC; Bookvich AV; et al. (2009). “MiSearch adaptive pubMed search tool”. Bioinformatics. 25 (7): 974–976. doi:10.1093/bioinformatics/btn033. PMC 2660869. PMID 18326507. ^ Smalheiser NR; Zhou W; Torvik VI (2008). “Anne O’Tate: A tool to support user-driven summarization, drill-down and browsing of PubMed search results”. Journal of Biomedical Discovery and Collaboration. 3: 2. doi:10.1186/1747-5333-3-2. PMC 2276193. PMID 18279519. ^ “ClusterMed”. Vivisimo Clustering Engine. 2011. ^ Rebholz-Schuhmann D; Kirsch H; Arregui M; Gaudan S; et al. (2007). “EBIMed–text crunching to gather facts for proteins from Medline”. Bioinformatics. 23 (2): e237–e244. doi:10.1093/bioinformatics/btl302. PMID 17237098. ^ Kim JJ; Pezik P; Rebholz-Schuhmann D (2008). “MedEvi: Retrieving textual evidence of relations between biomedical concepts from Medline”. Bioinformatics. 24 (11): 1410–1412. doi:10.1093/bioinformatics/btn117. PMC 2387223. PMID 18400773. ^ Fontelo P; Liu F; Ackerman M; Schardt CM; et al. (2006). “AskMEDLINE: A report on a year-long experience”. AMIA Annual Symposium Proceedings. 2006: 923. PMC 1839379. PMID 17238542. ^ Fontelo P; Liu F; Ackerman M (2005). “MeSH Speller + askMEDLINE: Auto-completes MeSH terms then searches MEDLINE/PubMed via free-text, natural language queries”. AMIA Annual Symposium Proceedings. 2005: 957. PMC 1513542. PMID 16779244. ^ Fontelo P; Liu F; Leon S; Anne A; et al. (2007). “PICO Linguist and BabelMeSH: Development and partial evaluation of evidence-based multilanguage search tools for MEDLINE/PubMed”. Studies in Health Technology and Informatics. 129 (Pt 1): 817–821. PMID 17911830. ^ Hokamp K; Wolfe KH (2004). “PubCrawler: Keeping up comfortably with PubMed and GenBank”. Nucleic Acids Research. 32 (Web Server issue): W16–W19. doi:10.1093/nar/gkh453. PMC 441591. PMID 15215341. ^ Eric Sayers, PhD. “The E-utilities In-Depth: Parameters, Syntax and More”. NCBI. ^ “MEDOC (MEdline DOwnloading Contrivance)”. 2017.